We switch clubs depending on whether we’re facing down a sand trap or a nice stretch of fairway, we choose balls depending on how much spin we want to get out of them, but the one constant companion in a game of golf is your bag, so with that in mind, it makes sense to seek out one of the best golf bags around. The big daddy of tour-ready luxury is the tour bag, or staff bag. These tend to look amazing, have a high-quality build, and have the capacity to carry everything you need, but weigh roughly the same as a small horse. 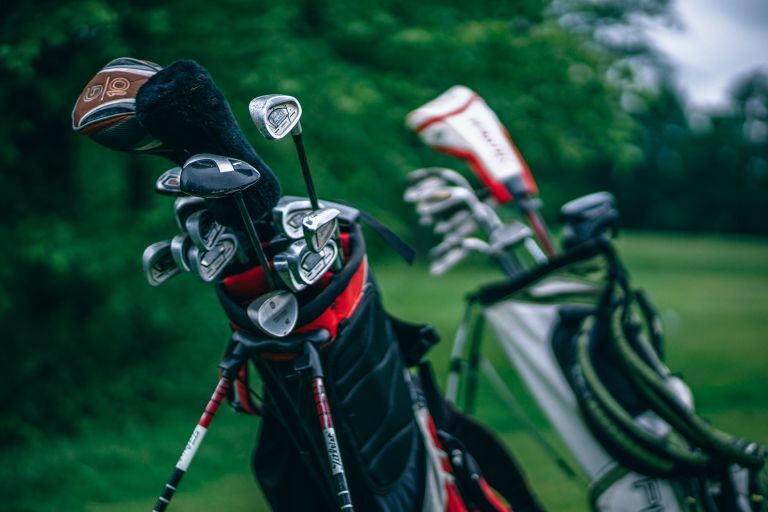 Our top choice overall, for these reasons, is the Titleist Tour Staff Bag, but if that all sounds a bit fatiguing, there are a few lighter types to choose from too. Stand bags are lighter and come with retractable legs so that, suitcase-like, you can carry them for short stretches and then prop them up on the stand while teeing up. Carry bags, aka Sunday bags, don’t have retractable legs, but are usually lighter again than stand bags. Finally, there’s the cart bag. Slightly smaller and much lighter than a tour golf bag, these are designed to be carried – you guessed it – on a cart. Whichever type sounds like it’ll be your bag, keep reading for our best bets. If you fancy yourself a spot on the next Masters tour, the only thing to be seen carting around (or rather, for your caddy to be seen carting around) is this Titleist tour bag. It’s our top pick for its undeniably amazing looks and top-quality construction, and get this: reviewers say it’s not too heavy either. There’s a 6-way top divider that ensures you always have an eye on the right club, quick-release magnetic pockets and those with military-grade zips for safekeeping, and foam cushioning plus a ergonomic strap system for comfortable carrying. For golfers with mobility problems, those who fatigue easily, or simply anyone who can’t be doing with the faff of an overly heavy bag, consider this: our lightest golf bag. The aptly named Callaway Hyper-Lite comes in at just 2.5lbs but doesn’t go light on the functionality, with a durable nylon shell, sturdy carbon fibre legs, a four-way club organisers with full length dividers to get at clubs quickly, and handy dedicated pockets for phones, valuables and balls. As with the Titleist tour bag, the padded shoulder straps are a boon, too. This Sun Mountain golf bag is a little like a caddy (just not a very talkative one) with the range of handy services it provides. The built-in lift assist handle and dual-padded x-straps with high density foam make for the utmost in comfort as you cart it around; the automatic carbon fibre legs eliminate unnecessary fiddling while you’re getting ready to tee off; and the range of storage options is superb, including a full-length clothing pocket, drinks pouch and velour-lined valuables pocket. Another gorgeous-looking tour bag, this one comes courtesy of TaylorMade, but this time is designed for those who cart, rather than walk, around their course of choice. Featuring TaylorMade’s own 2018 colours, it’s an eye-catching design in a smaller scale than a traditional tour bag, optimised for easier lifting and cart-friendliness. Even so, it still manages to squeeze in a 6-way divider that gives ample space for a full set of clubs, and a whopping 12 pockets, including two full-length garment pockets. As well as helping to ease the burden across 18 holes with its lightweight construction, this Ping Hoofer Lite Stand Bag has a strap system that wouldn’t look out of place on a hiking backpack, making it quite possibly our most comfortable golf bag. The beauty of these straps is that they offer a customisable fit, making this a good one for tall and small players alike, and the portion of the strap most liable to rub, the part that falls at the shoulder, is both padded and packed with SensorCool technology to stop uncomfortable friction. Like the look of the Titleist tour bag, but not the sound of that heft? Well, it turns out you can get the brand’s good looks in a much more back-friendly form, the Titleist Players 5 StaDry Stand Bag, which has a dual to single strap carry system to help evenly distribute the weight of your kit across your back and shoulders while you walk from hole to hold. Its biggest seller, however, is its waterproofing – if you live somewhere where getting caught in a shower mid-match is a distinct possibility, the fully waterproof seam sealed design is sure to appeal.